It would be nice for articles to dig a little deeper for the sake of the general public. If you are building a house there are multiple inspections that one is required to pass prior to continuing with the next phase, and additionally, before additional money is paid. With all of the focus on this passenger ferry, the ‘surprise’ delays, and now the welds, the question is who was managing this project within NCDOT Ferry Division, and how much is this going to cost the tax payers (delays, construction of a sinking ship, and now the rental of a private ferry). Some accountability is warranted, the people of Dare, Hyde and visitors deserve better. @OBX Resident its called no oversight and the state doesn’t really care. “If the new one is dead, we might purchase one,” Torbett said. Tells you all you need to know right there, they will continue to throw money at this lame idea no matter the cost. $8,500 per day rental not counting fuel so basically over $10,000 per DAY to ferry a handful of people to Ocracoke and back. Heck, might as well just throw all that money into the Pamlico Sound and people can just walk across the piles of cash to Ocracoke and never get their feet wet! Lol! 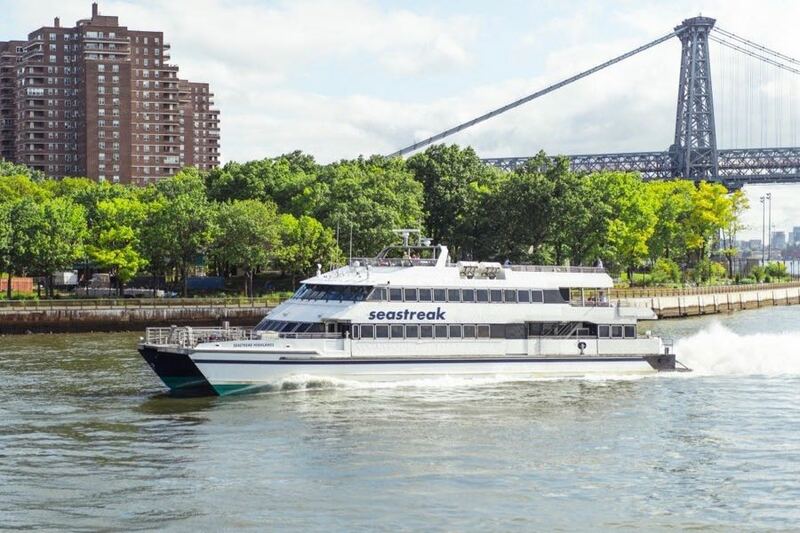 I especially love this BS statement; He said the Ferry Division met with the owner of Seastreak on March 29 in Hatteras and a test run was done on the route, though Torbett did not know whether it was done with the proposed rental vessel. Just tell the truth ! Torbett knows good and well they didn’t use the actual rental vessel and statements like that tell you how determined they are to push this forward and think NC citizens are stupid. I am not a fan of NCDOT, but @REALLY? is really taking a shortsighted view of this project. The ferry division already has a daily people count of daily to and from Ocracoke. So what fraction will gladly leave their cars and pay a toll? I think a lot. Your estimate may vary. The future of Ocracoke as a mostly car free destination is a bright as the sun. It has worked very well on other islands, notably Macinac (Michigan). The actual vessel to be used did not have to take the route as a test, but DOT as well as the vessel owners needed to verify water depth and ease of navigation on the route. Ocracoke is a treasure and we need to regard it as such. @windybill, I hope you’re right but shortsighted is also thinking that just because it works in Michigan that its going to work here. Other than them both being an island, there’s not much to compare. I’m not saying the actual vessel had to make the trial run, I have a problem with Torbett saying he “didn’t know” if the actual vessel was used. BS!! He knows good and well it wasn’t used so why not just say so? You mean to tell me Torbett is up in Raleigh appropriating money yet doesn’t even know if they used the actual boat? Really? Boy, we have some dim bulbs in charge of the purse strings. I cant believe more people don’t have an issue with the fact that taxpayers have already bought a boat in the stupid Corolla debacle just to scrap the vessel, now the state dim bulbs are ready to scrap ANOTHER vessel in the Ocracoke debacle.. That’s outrageous! I think passenger numbers will be up at first like any new novelty but over time on a 147 passenger vessel I bet they’ll be lucky to get 47 passengers. Time will tell but somebody is acting like its their pet project an are insistent this gets going at ANY cost.